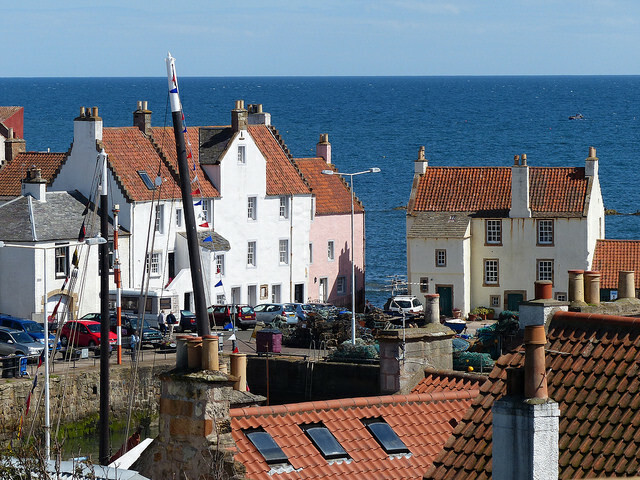 Each year in August, the Pittenweem Arts Festival is held. This year 2019 the Festival dates are 3-11 August. It’s a great opportunity to visit the village when every available space has been turned into a mini-art gallery of arts, crafts and tutoring. 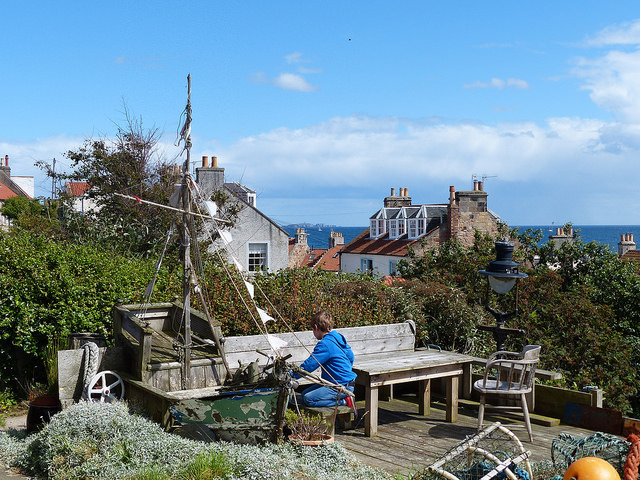 If Sandcastle Cottage is already booked, we still make the journey up to Fife to go to the festival as it’s one of the ‘do not miss’ events in the East Neuk of Fife for our family. Arriving in the village, you’ll be guided to the big car park where helpful stewards will find you a space, and other eager volunteers will be on hand to sell you a programme and guide for the event. It’s a good idea to make sure that you’ve spent some time taking a look at the website and Facebook page for the festival before you travel as one thing is for sure: you won’t see everything in one day and you may need to be selective. We’d checked the weather forecast before setting off, and were delighted to peek over the rooftops of the upper part of the village towards the Forth to see that the weather at that point was even better than we’d been expecting. As we’d arrived a little later than planned, our first stop was at the marquee at the harbour where David Barnett Catering were doing a sterling job of supplementing the local businesses and providing food and sustenance for festival-goers. All the regular businesses were doing a good job too, but we wanted to be quick so that we could get on with our tour. One stop which is an absolute essential is that of the family group at venue 74, where the work of Reinhard Behrens, Margaret L Smyth and Kirstie Beherens is on show. I love to see the latest in Reinhard Behrens’ expeditions into Naboland, and with views like the one below, and a pirate ship in the garden, you could be forgiven for simply visiting to drink in the gorgeous views from every aspect. 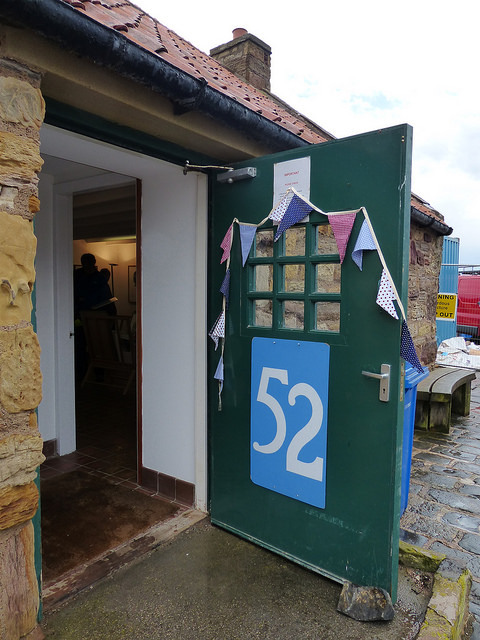 As a long-time fan of the work of Alexander McCall Smith, I had spotted that one of the invited artists this year was stationed at The Old Men’s Club at Pittenweem Harbour, where we’ve seen many interesting exhibits over the year. This year, Iain McIntosh was exhibiting some of his illustrations. His work was known to me as the illustrator of many of McCall Smith’s stories, and I was eager to see what he’d brought along. Before I’d even had time to take in the scope of the exhibition, a print called The Crail Whale had caught my eye, and having checked the price, I determined that this would make a delightful addition to our little print collection, immediately decided to buy it. However, I’d made a real rookie mistake! No cheque book with me, and insufficient funds in my purse. 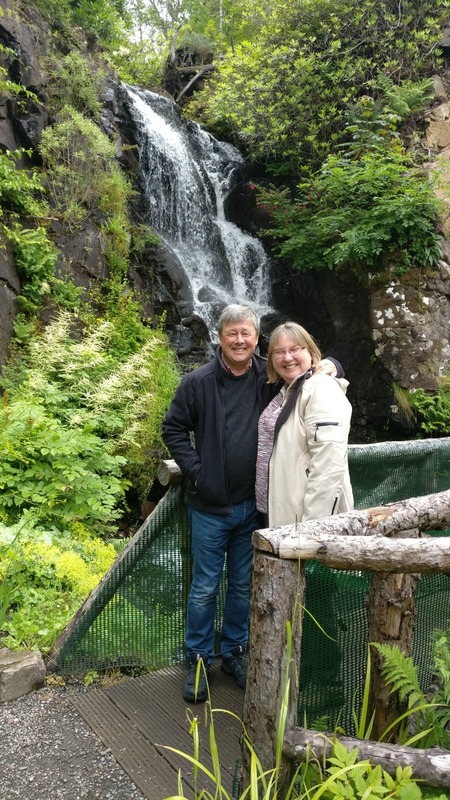 The lovely Mr McIntosh and his helpful assistant pointed us in the direction of Pittenweem Post Office where we should have been able to withdraw funds at the counter. However, mistake number 2. It was Saturday… and the afternoon. 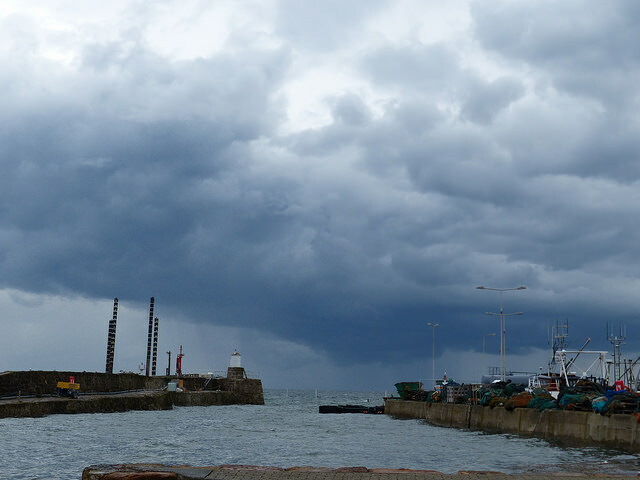 As we wandered back down to the harbour to break the news that we’d have to head elsewhere to find funds, we noticed that the sky was darkening and a couple of (forecast) showers were definitely headed our way. We thought we’d make sure that we secured ice creams in Nicholson’s Ice Cream Shop before the deluge hit. 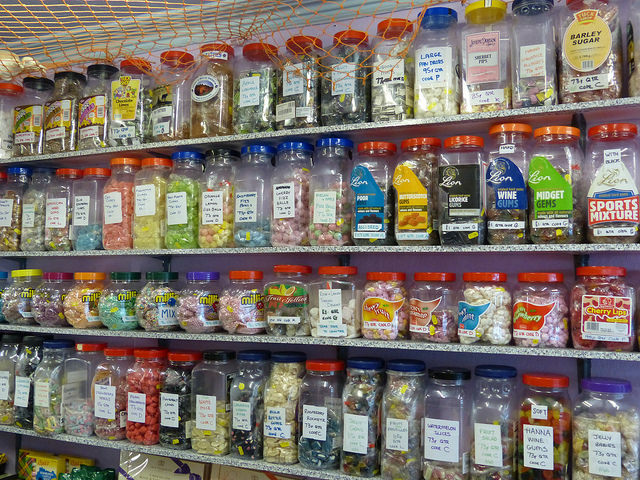 However, as the queue was long, we ended up stranded in the shop while we licked our chosen ice creams and marvelled at the vast range of jars of sweeties of every hue and flavour on display. I can think of worse places to be stranded! A quick drive along to Anstruther Co-op to the nearest cash machine, and our honour was saved with the famous visiting artist, but unfortunately by the time we’d done that we didn’t have enough time left before the exhibitions closed for the day to return to the car park and do more exploring. We’ll just have to plan our next visit better. 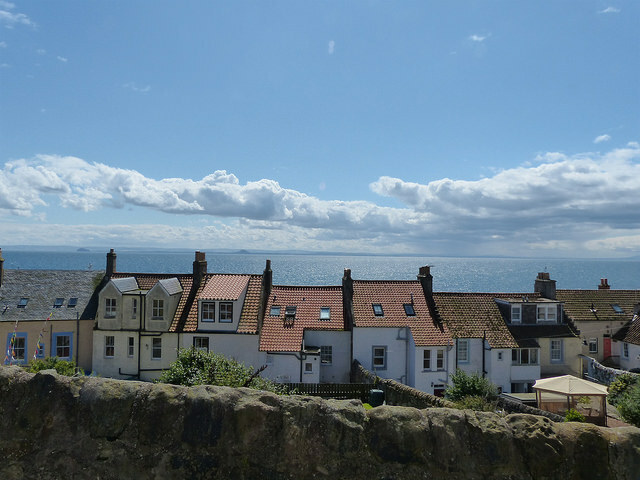 Book your next stay in Fife at Sandcastle Cottage, Crail – just check availability by putting your chosen dates into the box to the top right of this page.